Now she has a decision to make: face a world filled with danger and discover her own power, or return home where it's safe and live in a gilded cage. This series just keeps getting better and better! I really enjoyed the first book, INTO AETHER, so when I was offered the opportunity to read the rest of the series by the author, I couldn't resist. And I am sure glad that I didn't. In ESCAPE AETHER, we are given the opportunity to really get to know the second of the Trinity, Valera, as well as meeting the third, Julia. Valera feels smothered at home as her mother tends to be overbearing and has rather firm ideas on just how a young lady should behave. She had dreamed of visiting the human world though nothing is quite like we dream. I really enjoyed watching Valera discover herself and her strengths as well as getting the chance to meet Julia. Both girls grow and learn quite a bit about themselves and each other. We also get the chance to revisit Theo as she faces the music back at her new home. 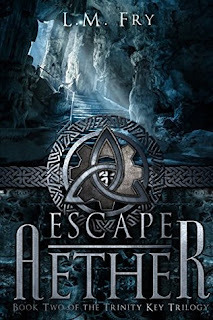 ESCAPE AETHER is a great coming of age story set in world of airships and automations with danger lurking about every corner. Perfect for all ages, this story will capture your imagination and hold it until the very end.